Calls released by the United States of America last week to stop war in Yemen and turn into peace are but "code" for launching new escalation stage, said the Houthi leader on Wednesday. 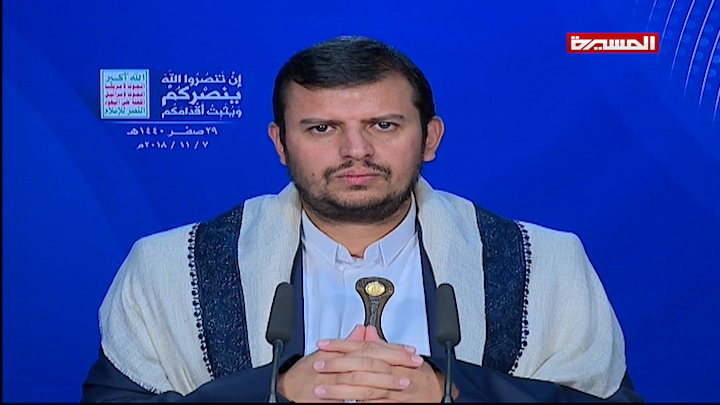 Abdul Malik al-Houthi, leader of Ansarullah, stated, in a TV statement about developments in Hodeida, that the Saudi-led coalition "mainly depends on US supervision, planning, weaponry and logistic support. The US tone about peace in Yemen is more likely a practical code for launching every new escalation stage." Houthi statement comes four days after battles flared around the western port city of Hodeida, where Yemeni joint forces backed by a Saudi-led military coalition to take control of the strategic harbor from the Iran-backed Houthi Group. The new escalation came after US statements calling for dialogue according to US view, Houthi added. "Americans commence every escalation step prepared by them with prior statements on peace. Although, they manage and arrange for war. The word 'peace' in US use in war on Yemen means war and battle. "The US role is main and essential in the military operation." Americans "are fully involved in aggression with all its crimes against our people. "Actual significant role are conducted by US, Saudi and UAE, and traitors are but executing on ground." He said that his group expected arrangements for a great military escalation, which "was given one-month respite". Washington, represented by its secretaries of defense and state, called on 31st of last October for stop of war in Yemen and involvement into negotiations by the end of this November. The UN envoy to Yemen, Marten Griffith, confirmed on the same day that he is still committed to bring together all parties warring in Yemen on negotiation table within one month and that dialogue, but not military actions, is the only way for comprehensive agreement. The Coalition and Yemeni Government apparently try, through escalation, to take control of the strategic port city before commencing the negotiations that the UN envoy to Yemen called for, in order to strengthen the position.